As you spin the yarn on your spinning wheel, it winds on to the bobbin. It then fills up the area directly below the hook that it is passed over. You should move the yarn over the hooks frequently to avoid an uneven buildup of yarn. If you wind it unevenly, this can cause problems later when you ply or wind the yarn off. This buildup can also cause an uneven twist in your yarn. The hooks on most flyers are offset, which makes it easier to fill the bobbins evenly. You move the yarn from the hook on the right side to the hook on the left side, from one end of the flyer to the other. Now that you have a full bobbin, you can choose to take it off and use it later to ply with another bobbin (, or you can wind it off into a skein. Skeins are a good way to store yarn. They let the yarn relax, they are ready to wash or dye, and you can easily see and feel what the yarn is like. 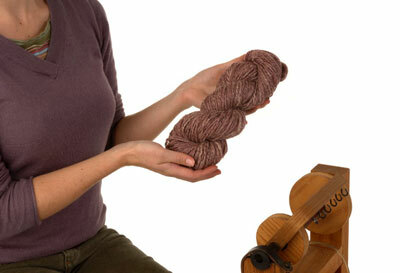 Here is how to make a skein from wheel-spun yarn. Leave the bobbin on the wheel and take the tension off the bobbin. 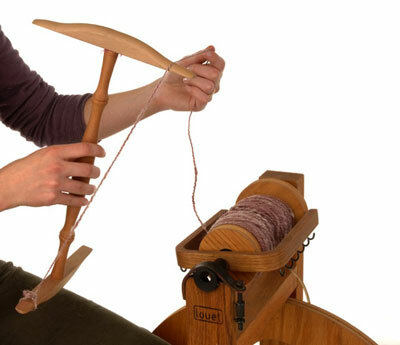 Hold the niddy noddy in your fiber hand and tilt it away from you. Pull a bit of the yarn off the bobbin and tie it to the bottom arm of the niddy noddy. Pass the yarn from the bottom of the niddy noddy to the top in the front. 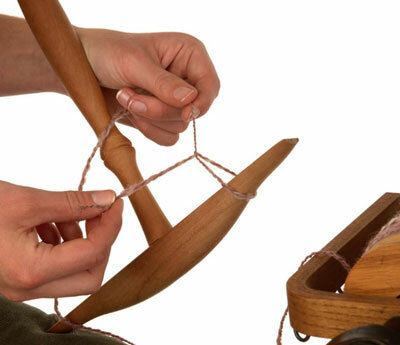 Tilt the niddy noddy toward you and pass the yarn from the top of the niddy noddy to the arm at the back. Tilt the niddy noddy away from you and bring the yarn around the other arm at the top. Come back to the start and continue, making a circle with your yarn until the bobbin is empty. Tie off your skein in four places. Use the ends of the yarn for two of the ties, and undyed cotton for the others. Slip the skein off the niddy noddy. Hold it stretched out between your two hands. Twist one hand toward you, and the other hand away from you. Let the fiber relax and twist around itself. Tuck the ends in the skein through one another.